In the United States, approximately 90 percent of adults experience back pain at some time in life, and 50 percent of persons in the working population have back pain every year. Diagnosis and Management of Acute Low Back Pain Atul T. Patel, M.D., and Abna A. Ogle, M.D., University of Kansas Medical Center, Kansas City, Kansas; Am Fam Physician. 2000 Mar 15;61(6):1779-1786. Sedentary jobs have risen 83% since 1960 and now account for 43% of all U.S. jobs. Office workers sit more than 80% of the workday, placing them at increased risk for many related pathologies. Cross-sectional Examination of Long-term Access to Sit–Stand Desks in a Professional Office Setting; Lucas J. Carr PhD, Maggie Swift BS, Alex Ferrer BS and Roberto Benzo MS; American Journal of Preventive Medicine, 2016-01-01, Volume 50, Issue 1, Pages 96-100, Copyright © 2016 American Journal of Preventive Medicine. Workers with mostly sitting jobs had significantly higher overweight/obesity risk than workers with mostly standing jobs. Chau JY, van der Ploeg HP, Merom D, Chey T, Bauman AE. Cross-sectional associations between occupational and leisure-time sitting, physical activity and obesity in working adults. Prev Med. 2012; 54 (3-4):195-200. 80% of Americans Experience back pain: Stewart WF, Ricci JA, Chee E, Morganstein D, Lipton R. Lost Productive Time and Cost Due to Common Pain Conditions in the US Workforce. JAMA. 2003;290(18):2443-2454. doi:10.1001/jama.290.18.2443. 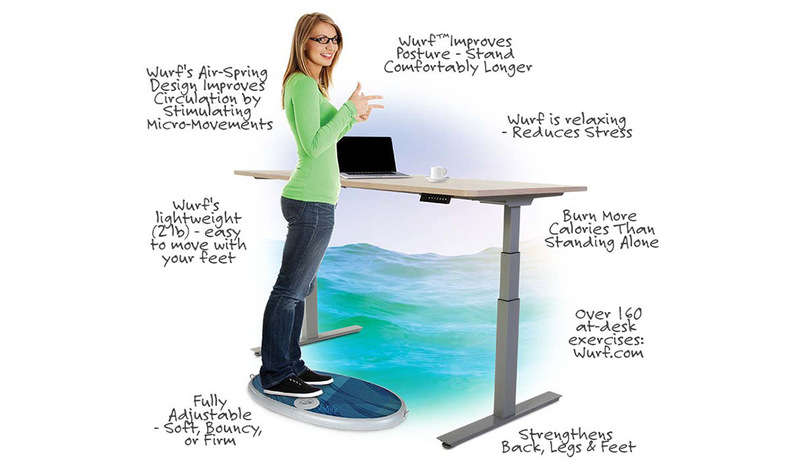 Standing burns 33% more calories: Difference in caloric expenditure in sitting versus standing desks. Authors Reiff C1, Marlatt K, Dengel DR., School of Kinesiology, University of Minnesota, Minneapolis, MN, USA. Cite: J Phys Act Health. 2012 Sep;9(7):1009-11. According to Dr. Porcari, the exercise intensities seen during this research are on the cusp of moderate to vigorous intensity. “We would expect participants to report ratings of perceived exertion of about 13 at this intensity level,” he reports, “but the subjects averaged an RPE of 11.7, or a light to moderate intensity.” This tell us that the mini-trampoline workout did not feel as intense as it really was. Ace-Sponsored Research: Putting Mini-Trampolines to the Test; By Paige Burandt, John P. Porcari, Ph.D., Maria L. Cress, M.S., Scott Doberstein, M.S., and Carl Foster, Ph.D., with Daniel J. Green; Professional Resources; Certified ProSource: October 2016.